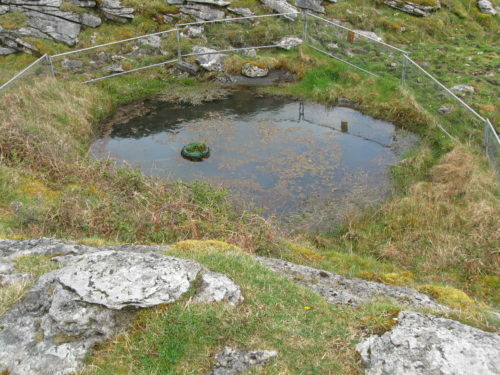 A turlough or turlach is a limestone feature that is almost unique to Ireland. The name comes from the Irish word tuar, meaning dry, and the feature is a disappearing lake. The lake fills from water rising up through the holes in the limestone ground and it later disappears in the same way, back into the ground. Some turloughs result from a period of heavy rain. The underground passageways become full of water and some of it comes out above ground and sits on the surface for a while, until water levels drop again. Other turloughs are seasonal, filling up in the autumn and draining away again in spring or early summer. Where the cave system ends under the sea, turloughs can be controlled by the tide, with the water level in the lake rising and falling as the tide comes in and out. Most touloughs flood to just a few metres in depth and Ireland’s largest covers about 1 square mile. Turloughs are common in Ireland but rare elsewhere. 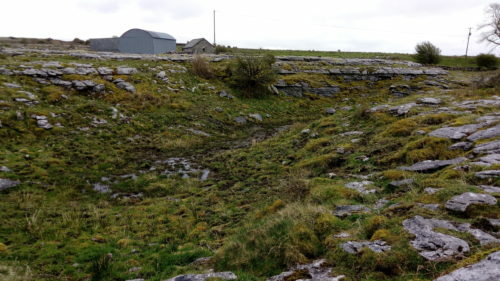 This is because in Ireland the limestone forms low land close to sea level, whereas usually limestone tends to form higher land, leaving plenty of space for water to drain down through the rock, without all the passageways becoming flooded. There is a turlough in the UK, at Pant-y-Llyn, near Llandeilo, in South Wales. It is seasonal in nature, filling in late autumn and emptying again by June.